This article is about the card rarity. 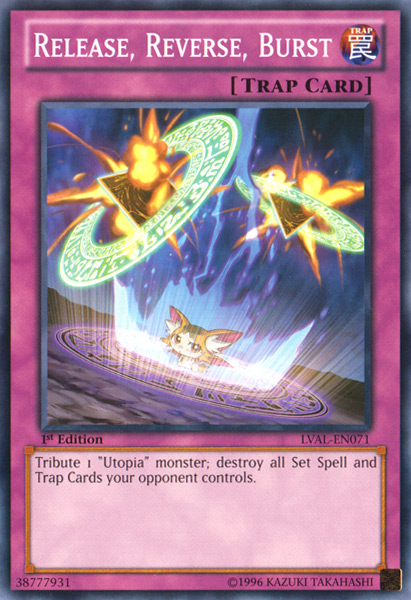 For the faction in the Yu-Gi-Oh! ARC-V anime, see Commons (ARC-V). "C" redirects here. For the series, see "C". For the archetype, see "C" (archetype). A Common (Japanese: ノーマル Nōmaru "Normal"; Korean: 노멀 Nomeol "Normal"; Chinese: 普通 Pǔtōng "Common") card is identified by having a black (white for Spells, Traps, and Xyz Monsters) card name, and does not have any holofoil on the card name or image. Some common cards are short printed by Konami. A listing of all super short or short prints can be found in Beckett's Official Magazine. For Booster Packs from "Legend of Blue Eyes White Dragon" to "Light of Destruction", packs always contained 8 Commons, from "The Duelist Genesis" onward, it is possible to have a pack with only 7 Commons, since it is possible to get a Rare and a Holo in the same pack; Duelists Packs and reprint packs contain a different amount of cards in each pack. Because they're so easy to find and are often much less powerful than rarer cards, commons are worth much less than other cards. That doesn't mean commons can't be powerful and valuable, though. On the Official Card Database, this rarity is unmarked. In Yu-Gi-Oh! BAM, Common cards and are identified by (Series 1), (Series 2) or (Side Series). These cards have a cost of under 75000 or under 15. Before the new shop update on August 8, 2013, these cards had a cost of under 100000 or under 20. This page was last edited on 16 July 2018, at 01:48.